Do you have investments? Is money sitting in your bank account without being used? Or you wanna prepare for when you're gonna make those big bucks as an engineer? 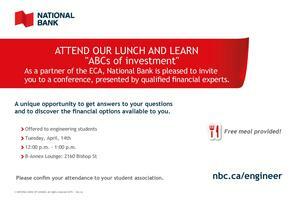 Then don't forget to confirm your attendance to our Lunch and Learn, presented by analysts from the National Bank of Canada! – Number of free lunches is limited to those who register online.